People are living in "tiny houses", timber woodland structures, and canal boats – and one YouTuber has set up home in a converted ambulance. The UK housing crisis is leaving millions of people unable to save for price-rocketing properties – the average deposit for a first-time buyer is around £33,000. A shortage of housing has meant that even the rental market has become unaffordable for some. BuzzFeed News spoke to Brits who are avoiding this by making their bed in unorthodox places, sometimes under the radar of planning laws, including a student who lives in a van in Canterbury, sculptors who call a “world” of shipping containers their home, and a woman who “guards” empty properties from squatters. Their lives aren’t without compromises, but all say they're happy with the choices they've made. 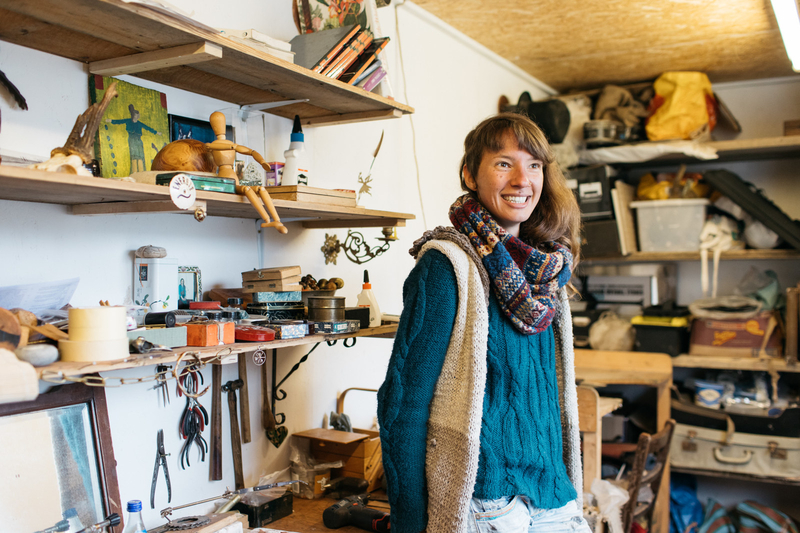 PHD theatre student Phoebe Patey-Ferguson moved into her fibreglass houseboat in London in September 2015. It cost her just £2,500 to buy and a further £1,500 to make it habitable, with the help of her stepdad. The 26-year-old pays £380 a year for her continuous cruising licence, an arrangement with the UK’s Canal and River Trust that means she must move every two weeks and travel a total of 20 miles per year. At just £32 a month plus maintenance costs, her living arrangement sounds like the perfect alternative to the rental market, but there are serious downsides. “I don’t have electricity, plumbing, running water, solar panels, a kitchen, or a fridge,” Patey-Ferguson says, adding that she relies on access to washing facilities at her gym, and eats out a lot to compensate for the lack of utilities. “But it’s cosy! It’s manageable. It’s a compromise in terms of not having creature comforts. I have a wood-burner to heat the boat in winter. It’s the warmest and driest, least damp, least mouldy place I’ve ever lived in in London. Renting in London is barely affordable on the amount she receives from her PHD funding, she says. “I would be living on stale bread and beans on toast and not going out. It wouldn’t work. Though she is unable to save money, she says her life in the houseboat means she can have the lifestyle she wants: socialising, going out, having drinks, using the London underground, and travelling abroad. And of course, her home can travel too. “In the summer I was up in the Leigh Valley. … I got woken up by geese a lot. I like the adventure side [of houseboat-living]. It’s peaceful. In the summer you open the doors, sit on the deck, and have a beer, it’s very blissful." So would houseboat living allow more students to escape the ever-increasing rental market? “I don’t think living on a houseboat is a viable solution to the housing crisis, because not everyone can move on to the canals," Patey-Ferguson says. "The only solution is rent control. Robyn Winfield-Smith, a theatre director, needs to be close to central London, where she works. She has 1,000 square feet of central Zone 1 living area to herself, a space she estimates would cost up to £14,000 a month on the rental market. She pays just £425 a month. This remarkable rate of rent is down to her role as "head guardian" in a Live-In Guardians (LIG) scheme. Winfield-Smith and her 19 housemates live in someone else’s building while it’s unoccupied, and maintain the property by keeping the utilities running and protecting it from squatters. Winfield-Smith became a guardian five years ago. The scheme is popular: She was selected from a waiting list of 500. The catch is that there’s no guarantee of how long you can stay in the property you “guard” – the notice period is only two weeks. The owner of her current home will eventually turn it into a hotel. Winfield-Smith will look for an alternative way of living when she decides to start a family, but says guardian schemes could be part of the solution to the housing crisis, “because there are empty properties, not just in London, but across the country”. Architecture student Jonny Bush couldn't afford to rent and study at Canterbury University so he put his design and engineering skills to work by converting a 20-year-old van into a habitable mobile home. He estimates he has saved over £10,000 in rent by living in his van, which cost £2,000 to modify in September 2015. Bush even used his van in a project for his degree course, so that he and his girlfriend Rhiain could spend an estimated 900 hours on the conversion, including modifying the engine so that it ran on vegetable oil, insulating the walls, and fitting a bed and kitchen unit. The vegetable oil is a cheap alternative to diesel, allowing him to use unwanted oil he collects for free from chip shops and the university kitchens. His mum made his curtains. Jonny Bush's project work on the design of his van renovation for his architecture degree. “I’m very happy living in my van, I think it’s the best decision I ever made,” says Bush. “The best part is not being tied to be somewhere. I have real estate and I have the opportunity to move it, it’s brilliant. I have a cracking wood-burning stove, I can get it to 30 degrees in here when it can be zero degrees outside. The only downside is having to sometimes defrost my hot water bottle before I go to bed. 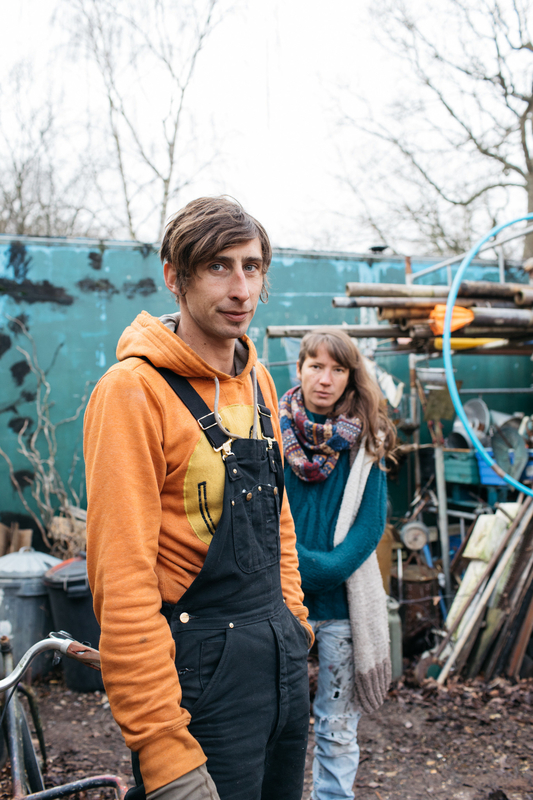 Sculptors Sam, 32, and James, 35, and jewellery designer Mira, 32 – all members of arts company Circus Kinetica – live and work on a 900-square-metre piece of private land in East Sussex they call The Yard. "The Yard was an old woodyard for many years, so that’s what it’s known as, the old woodyard,” James says. 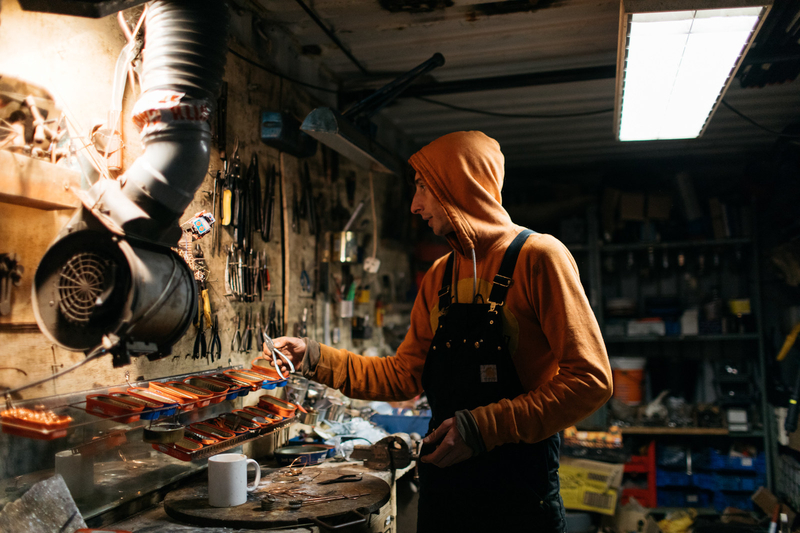 “Our landlord bought it – he’s got a big steel shed that he does a lot of car work in. We’ve got the end of his yard and we’ve built a world out of shipping containers." 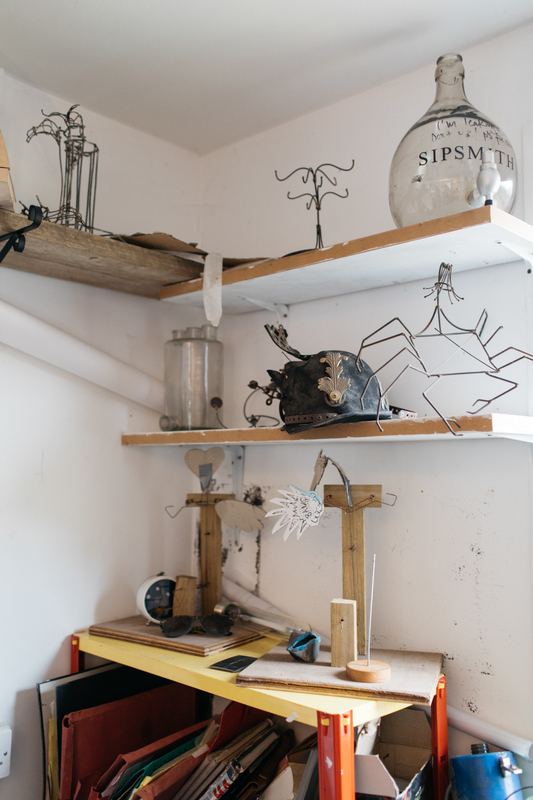 They live there with the landowner and other colleagues in caravans and containers, and also use the space to build steel sculptures, interactive art, and jewellery for clients such as festivals and cocktail bars. The trio haven’t sought planning permission for their homes. James and Mira, who are a couple, live in a shipping container combined with part of a greenhouse to make a lean-to structure, with a plastic corrugated roof that lets light into their kitchen. They call it their "little test house". When the group rented on the traditional market, they were paying around £3,000 a month together for an apartment/work studio. Now they pay around a third of that to their landlord. 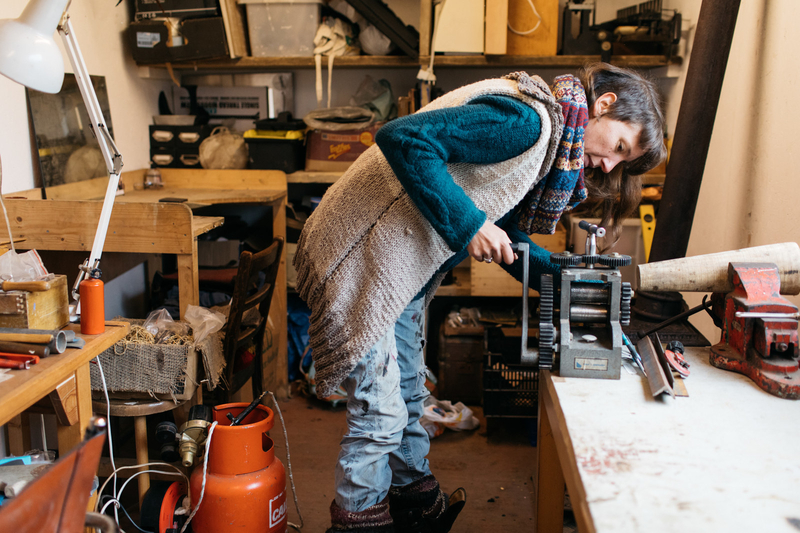 Mira making jewellery (left) and adding a log to the wood-burner (right). James in his shipping container home. Sam spends the summer living in The Yard and the winter months on a canal boat that is currently in Wembley. 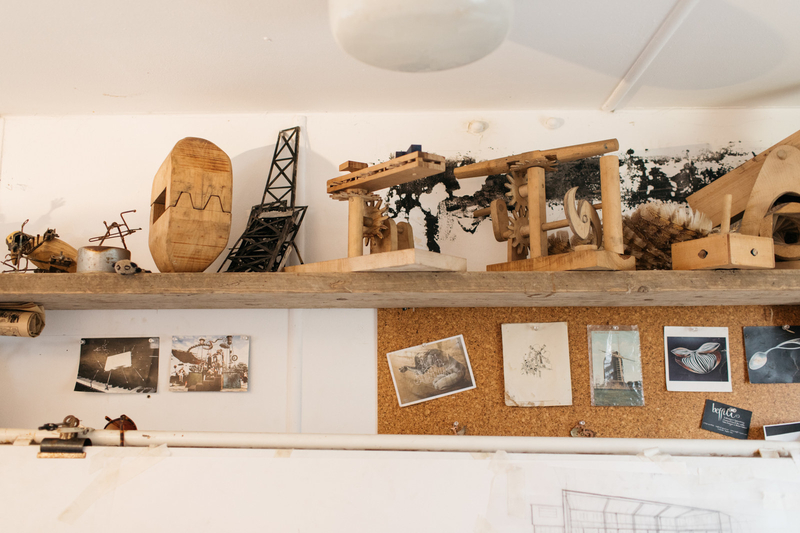 He explains how their unusual living arrangements came about: "Early on [the company] realised that we could either rent a flat or rent a space for us to build art, but we could not afford both.” In 2011 they created their first hybrid space, before later moving to the yard. "The best thing about the yard is the freedom and not doing what everyone else does, with the normal bills and pressures," Sam says. "And being out in the middle of nowhere when you’re working is useful in terms of headspace." James in his workshop in The Yard. "People get oddly selfish over other people coming into the neighbourhood, [and] people will report them,” says Sam. "People associate this kind of living with a group of people appearing in a field somewhere and trashing the place. ... There’s plenty of space for us. It could be welcomed, rather than people doing this clandestinely." See more photos from The Yard in the gallery below. Mark Burton supplies the UK with "tiny houses": wooden "micro home" cabins that start at £6,000 and are a fraction of the price of a bricks-and-mortar building. The homes are insulated and can be fitted with amenities like a kitchen, shower room, and toilet. According to his website, they offer "a bit more living space or temporary accommodation ... for a teenager, a spare bedroom for family or friends, a bit of extra B&B space". But, as Burton admits, the housing crisis is pushing some people to look to these miniature homes as permanent solutions to the unaffordable buying and rental market: "People want to either rent a piece of land on a farm or buy a small piece of woodland and have a tiny house and live in it, but the councils would not allow anything like that. "I know people who have done this and are living under the radar of the council, who wouldn’t want to be named." The interior of a tiny house. Burton says: "People who are renting have no choice, and the landlords are sticking rents up and taking full advantage of that. This is particularly so for the younger generation, which I think is wrong. "Parents building a tiny house for their adult children in the garden is quite a popular thing to do, because people can’t necessarily afford to move [out] because of house prices. Sonia Parsons with her daughters Daisy, 17, Asha, 13, and friend Emerald Worsley, 13, at Steward Woodland Community. Steward Community Woodland is a group of around 20 people who live on a 32-acre area of woodland in Dartmoor that they have owned since 2000, with low-impact sustainable living at the heart of their lifestyle. Their homes are timber-framed buildings on a sloping valley, are mostly made out of material from the woodland, and are either canvas-covered or timber-clad. Some of the members have part-time jobs – such as teaching assistant or photographer – but most of their time is spent managing the woodland and building utilities and tools such as homemade stoves, willow baskets, and wooden spoons. Sonia "Sonny" Parsons and Daniel Thompson-Mills at Steward Community Woodland. But the Dartmoor National Park Authority has refused to give the site planning permission, and dismissed the group's appeal against its ruling in August 2016. It claims the community has a “harmful” impact on the appearance and wildlife of the area, which the woodland dwellers dispute, saying they have in fact increased biodiversity on the plot. They are facing an eviction deadline of 2 December 2017 unless the decision is changed. They pay council tax but strive to be as self-sustainable as possible, growing their own food and producing their own power through hydroelectricity in the winter and solar power in the summer. “The housing crisis has been brought about by the crap economic system that we’re in,” said Thompson-Mills. “It’s not creating housing that people are actually able to afford, that is environmentally friendly. Mel Davis with her son Ash, 13, at their home in Steward Woodland Community. YouTuber David Coward found a new life on the road four years ago with his faithful dog Billy, living and travelling in a converted 28-year-old ambulance while holding down a seasonal job as a forklift truck driver. He bought the vehicle on eBay for £800 and spent a further £1,000 making it habitable with a bed, storage, and a wood-burner. "I don’t want to spend all of my life working to pay for a house that is going to be stuck in one place, possibly with neighbours that I don’t like," Coward said. "I don’t want all that hassle. Most people spend 25 years of their life paying for a mortgage. That’s a long time. I live my life – if I earn £500 in one week, then I spend £500, spending on what I want." Coward values his freedom, which enabled him to make a spontaneous trip to Loch Lomond in Scotland for Christmas last year. "The best part is waking up every morning and having a different view out the door. In the summertime I like to park up and watch the sunset, have a barbecue outside... I don’t get cold. My dog is a good little hot water bottle for when it’s cold in the night." The biggest downside is not having running water – Coward carries up to three gallons of water at any time, which can last him a week. He finds this a compromise worth making: "This is my life. I do not want to change it.